Jim Stark (James Dean), 17, moves to Los Angeles with his parents. The night before his first day of school, he gets drunk and winds up at the police station, where two other troubled teens, Judy (Natalie Wood) and Plato (Sal Mineo) are being questioned. Jim reveals that the arguments between his father and mother push him to do destructive things, especially when his father doesn't stand up to his mother. The next morning, he sees Judy and asks if she'd like a lift to school, but she brushes him off and leaves with her gang of friends, including boyfriend Buzz Gunderson (Corey Allen). At school, Jim's treated like an outcast by Buzz and his friends, but makes friends with Plato, to whom he offered his jacket at the police station the night before. Plato is bullied by the same bunch of kids and clings to Jim. After a field trip to the planetarium, Buzz decides to step it up a notch and punctures a hole in Jim's front tire with a switchblade. Jim approaches him in order to fix his tire, but Buzz goads him into a knife fight. He manages to knock Buzz's knife away, and throws his own down, telling Buzz he'll meet him anytime, but that he doesn't want to fight with knives. Buzz challenges him to a Chickie Runin which two cars race towards the edge of a cliff and the driver who bails first is called a "chicken." Jim agrees without realizing at first what a Chickie Run is, but feels he can't back out of it. The game ends in tragedy and Buzz's friends are called into the police station for questioning. They don't tell what happened, but spot Jim there. He think he's told on them, so they decide to track him down and rough him up. Jim doesn't tell the police anything because they don't express any interest in what he has to say. He goes home and gets into a confrontation with his parents. Judy meanwhile, has parent problems of her own and the two leave together to go to an abandoned mansion that Plato told Jim about. Buzz's friends follow Plato to his house, looking for Jim. Plato escapes them, but gets a gun and goes to the mansion. He finds Jim and Judy there, and they vow to be his friends. When he falls asleep, they explore the rest of the mansion, but the gang finds Plato and starts roughing him up. He grabs his jacket and runs. While hiding under a piano, he pulls the gun from his pocket and shoots one of the boys. Jim comes running to find out what's happening, and Plato almost shoots him, too. Police hear the shots and come, but Plato runs away and breaks into the planetarium. Jim and Judy follow. As the police surround the planetarium, Jim and Judy sneak inside to comfort Plato. 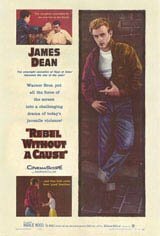 James Dean died in a car crash a month before the film was released. He was posthumously nominated for a BAFTA Film Award in 1957, while Natalie Wood and Sal Mineo were 1956 Academy Award nominees. Director/writer Nicholas Ray was also an Oscar nominee for his screenplay.